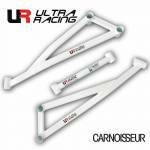 Established in 2002, Ultra Racing is a Malaysian based specialist manufacturer of chassis handling and tuning components. Ultra Racing has also been awarded the Asia Pacific Super Excellent Product Excellence Award (2007), Asia Pacific Top Brand (2009) and ISO 9001:2008 (2010). The range includes Ultra Racing Front Strut Bars, Ultra Racing Rear Strut Bars, Ultra Racing Side Fender Bars, Ultra Racing Front Lower Arm Bars, Ultra Racing Anti Roll Bars, Ultra Racing Side Floor Bars and Ultra Racing Torsion Bars. All the products are designed with safety and superior handling in mind. Tailor made for your car, Tein Suspension Kits need to be fitted in a professional workshop. Most of our Outlets will be able to offer a fitting service for Tein Suspension Kits - please contact your local Outlet to find out more.